Mallorca (the Balearic Islands) has a vast amount of beaches (208) and coves, which, until recently had a total ban on allowing dogs on them. However, this trend changed in 2012 and is now set to advance in a positive direction towards more access to dogs and their owners on beaches. The reason for this is that the town councils are finally starting to accept the large existing dog populations and their owners in their districts and the continuous growth in the number of people choosing to have a dog as a pet in their homes. This is not only happening in Mallorca but throughout whole of Europe. In this section, on your right hand side (and further below) under Beaches and Coves, you will find a mix of information on various beaches or coves that are good choices for you where you can take your dog with you. There is also information on the various districts, in Mallorca, and their rules regarding dogs on beaches. Below you will find the link to the official Balearic government’s website for all the beaches (not included some of the smaller coves) located in Mallorca and the rest of the islands. Below are the regulations, for both winter and summer period, that some of the town halls have made so that dogs can access beaches/coastal areas, (there are also other areas like the “unofficially” coves that many residents go to with their dogs, and for that information the best idea is to ask a local dog owner where to find one). 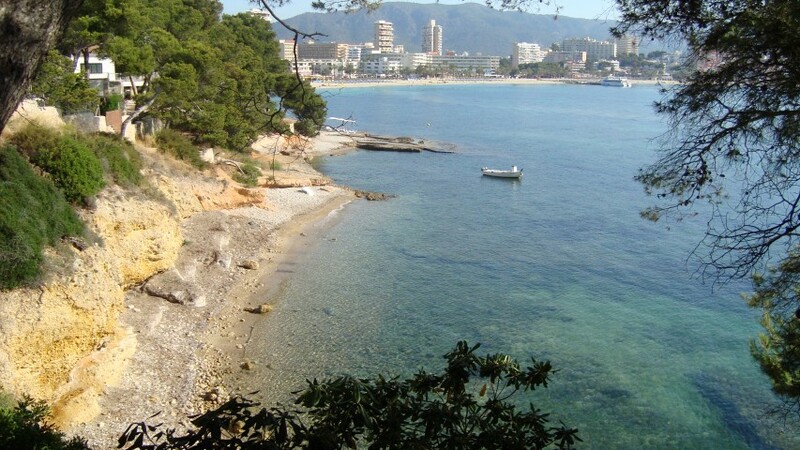 Andratx: You can access the entire beach -coastal- area with your dog during the off season, November to March (both included), they can be off leash* but the dog owner always needs to be in control of its dog and show respect to other people, with or without a dog. They also got an all year round area for the dogs to access, it’s called “Playa Cala Blanca” (take the turn off to Camp de Mar and then take the little road towards Port Andratx, and on that road you will find the sign, on the left hand side, indicating where the area is). Artá: You can access the entire beach -coastal- area with your dog during the off season, October to April (both included); for the moment they are not allowed off leash (because the town hall found a fault in their regulations about it, but they are working on changing that, so they can be off leash). The municipality are also working on allowing a beach area, (one or two) for the dogs to access the sea during the summer months; so it will be an all year around area for the dogs. However areas that are not classified as official beach areas are allowed for dogs to be on, all year round, including during the summer period. Calvia: They got two new all year areas set up (in 2016) Punta Marroig in Palma Nova and Cala Des Gats located (I do believe) in Paquera. NEW February 2017! Dogs will be allowed on all beaches during its winter period; November until before the start of Easter. However you must have your dog on a lead. Palma: They have set up an area for owners and their dogs, to access the sea, which is called “Es Carnatge”; you are allowed to access it during the whole year. This is the only place that dogs are allowed to access the sea in Palma. Pollença: They have set up a place not far from the Port of Pollença, the area is known as the “Llenaire” beach, and it permits dogs all year round, off the leash, in the area indicated with signs. And dogs are allowed on, off leash, any of the beaches-coastal areas during November to October (both included), due to the fact that the prohibition only mention the summer periods. Santa Margalida: Na Sa Patana, Can Picafort allow dogs all year round. So far this is the only area that dogs are officially allowed on in this municipality. *Please note that there may have been changes by the town halls, since this was written. However G4D will contact the town halls sometime during 2017 to check for any modifications, positive or negative, that may have been done.